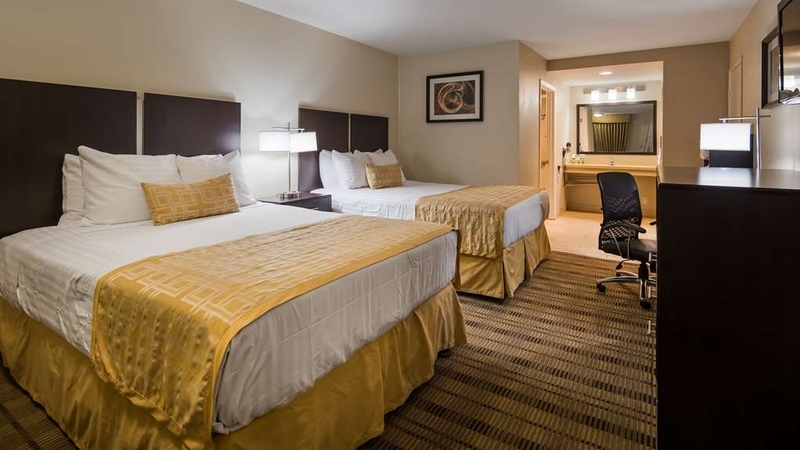 The Best Western Country Inn is ideally located in the center of Temecula. Come and experience our hotel near the major tourist attractions. Best price guaranteed and exclusive deals. Welcome to the Best Western Country Inn - to luxury with a country style. With 74 spacious rooms professionally decorated with elegant touches and fine quality furniture. 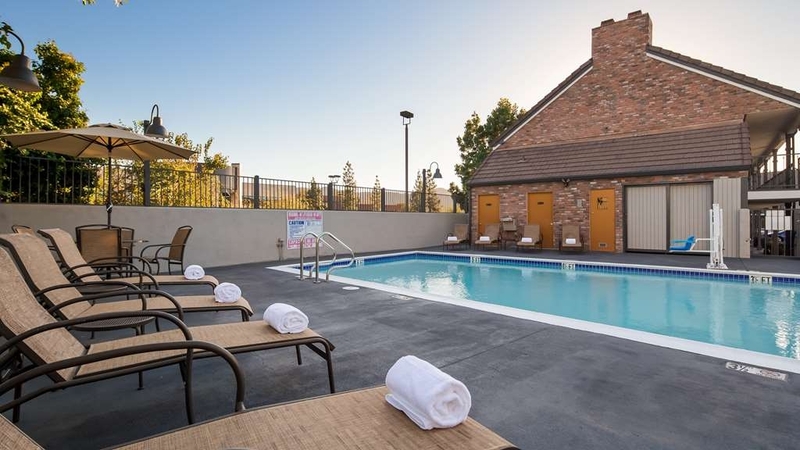 Guests can relax and enjoy the large heated pool and outdoor spa or a walking tour of Old Historic Town Temecula, less than a mile away. Rancho California, with its fine shops and restaurants, is also just one mile away. Temecula Wine Country invites you to a variety of wine tasting tours. Only minutes away is the Vail Lake Recreation Area, Lake Skinner and Lake Elsinore, where you'll enjoy fishing, sailing, boating, swimming and other water sports. Come and enjoy country style elegance at the Best Western Country Inn. Enjoy your stay. The Customer service is awesome we will be definitely staying again. Breakfast was hot and ready when we were. And towels were nice and soft. It is close to all stores and cute little old town Temecula which has the best food and drinks and entertainment. Got a voucher and a free night. Couldn't use them at the nicer property, right down street. I got the crew from mediocrity. At the Country Inn. No smiles, no enthusiasm, no employee was enjoying themselves. Rooms were Good, didn't eat breakfast, noise next door went on for about 45 minutes before they acted upon my complaint. The rooms would have to free again for me to stay here. Could've been better. The location was great it was near everything. When I arrived it was the middle of the night & my room wasn't clean as it should've been. But then again I'm use to staying @ more up scale hotels. So u get what you pay for! "Spiffy hotel providing good value"
This is a brand new hotel located only a few blocks from Temecula's interesting Old Town. (The city was once an important rail center, but interest now focuses on wine and olive oil, hence the wine- and olive oil-tasting opportunities available in town.) 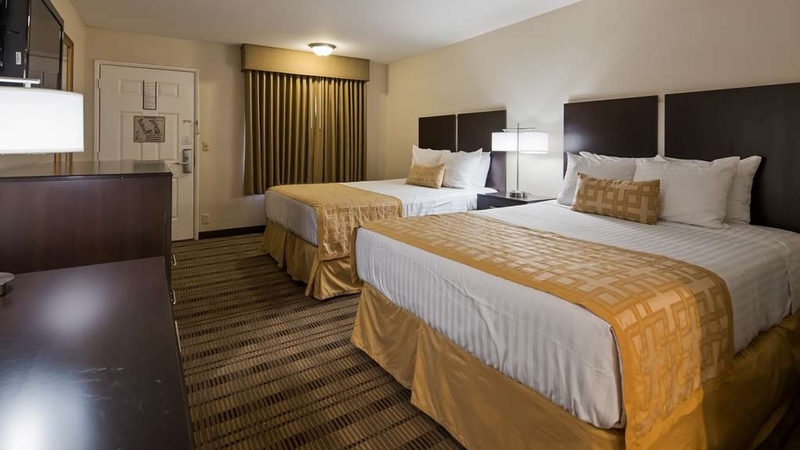 The hotel's rooms are spacious, pristine, and have good amenities. There is a comfortable sofa, a work desk, coffee maker, fridge, 70-inch TV, and – miracle to tell- good lighting. This hotel provides good value for your money. As with most hotels, sound carries easily through the walls. This hotel is clean, comfortable and well appointed. The room is large, has a microwave and refrigerator. The AC works well. The staff are accommodating and professional. They are also very nice. On top of that the room rate was very affordable -- something we value as retired travelers. Large room complete with fridge, microwave and coffee maker. Bed large and comfortable. Easy access to the Temecula wineries, with a lot of them within a 20-minute drive. Breakfast was very good with a large selection of hot and cold food. "Best Western Inn had live cockroaches"
Website pics looked great. Once we got inside we realized it was an older property that had been refurbished. We stayed Jan. 24, 2019 in a lower level room. We found live cockroach on the bathroom counter. My husband noticed an opened panel door below the vanity that led to the plumbing of the tub. We went to the desk with the bug we killed and the desk clerk casually just offered $15 off. Wow! I asked if he had any bug spray. Another customer was walking in, he said he would get back to me. He did bring bug spray to the room & apologized. Honestly, we were just so exhausted, we didn't want to have to find another room elsewhere. We took all our luggage out to the car, just leaving one change of clothes for ourselves, then sprayed the room. Of course we didn't sleep very well that night. We talked to the morning desk clerk about the situation, (we returned the empty bug spray can) she was very apologetic, and she took another $25 off. Best Western owner, PLEASE treat your property for cockroaches. No one wants to have that in their room! And you don't want that for your business. I felt like I needed to let others potential customers know of this. Thank you. I was supposed to say in and sleep in as I went to sleep late. Knowing that check out was at 11 am I was planning on checking out around that time and go back to the wineries. The decision to leave was for the noise of the workers working on the parking lot on Presidents Day. While works that day? Also none of the staff told me nothing about work being done early(8am) or did they apologized as I checked out. Horrible experience. 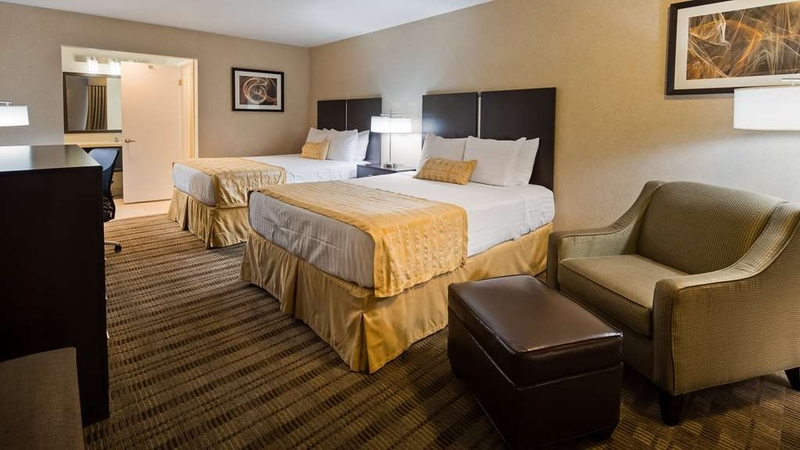 "Great place to rest your head and grab a very bus for a Van n Bozy tour of wine country in Temecula"
The Best Western was great. Clean good breakfast and friendly people. It was a great place to pick up our ride with Van n Boozy! Internet was fast. Beds are comfortable and nice and close to old town! Very great price for quality, size and comfort of the room. The bed is comfortable and I enjoyed the shower goodies provided. Receptionist was friendly, easy check in. Nice bathroom and seating area, great TV channel selections. Safe and pleasant location.Highly recommend! The room was nice and clean. Location was good too. Close to old town. A little to far to walk to Old town. Uber was just fine to get to old town. The jacuzzi was an added bonus and it was nice and clean. Room was not clean, hair on ice bucket! No liner! Hand prints on the mirrors. No elevators, No corridors, the room opens to the outside. When we were unloading our luggage a woman with a blackeye, staggering, came from downstairs and asked me for a cigarette...I don't smoke. This place is very shady!! When we saw the condition of the room and the activity outside, we packed our bags back into our car and got a refund. Location is great, the staff helpful and friendly but the room had obviously not be vacuumed. Hair and dirt in ice bucket w/no plastic liner available. Ugly spill and spot on wall not washed off, etc. Nice property and a good price The rooms were nice and clean. The breakfast was very nice. Staff was very nice. They were very helpful when trying to find a place for dinner. I had some very nosy people above me in the hotel. everything was great. The front desk staff were wonderful. They greeted me politely and the check in process was efficient. Room was clean and spacious. The breakfast exceeded my expectations with eggs, sausage, and potatoes. We reserved this hotel a few days before flying into California. It was one of the last hotels in that area that had a room the night we needed (the other was Motel 6). Now I know why. We stayed in room 204. Was told that all rooms were full that night. When we walked in, it had a terrible odor in the room. There were stains on the couch and the carpet looked warn/dirty. The worst thing is that there were ants in the bathroom and sink area. We discovered them when my son was trying to use the toilet, they were crawling on his legs! When we went to check out, I told the person at the front desk what we had experienced. He was not apologetic and didn't act surprised. When I asked for a refund he said the only thing he could do was take $20 off our bill. When I received the receipt in my email, I was still charged full price! And $250/night is by far way too much for this hotel! We ended up going to a much nicer hotel and it was only $140/night. I would never recommend this place to anyone. I enjoyed my stay. Close to fast food restaurants (within walking distance). Close to wineries, Pechanga. After a long day of wine tasting, this hotel is just what we needed. Nothing more, nothing less. If you are on a budget, this hotel offers everything you need. It is nothing special, but it has all of the necessities and is close to the wineries. Front desk staff were knowledgeable about the surrounding areas. We came to the Temecula area to visit wine country Old Town. It is centrally located for both. Check in was great and the front desk staff were awesome. There was more to the breakfast than I expected. All in all, pleased with my stay. Bed was extremely comfortable that made for a great nights sleep and hotel was clean! Great staff as well, very helpful front desk employee. Would definitely recommend this hotel. You will not be disappointed. 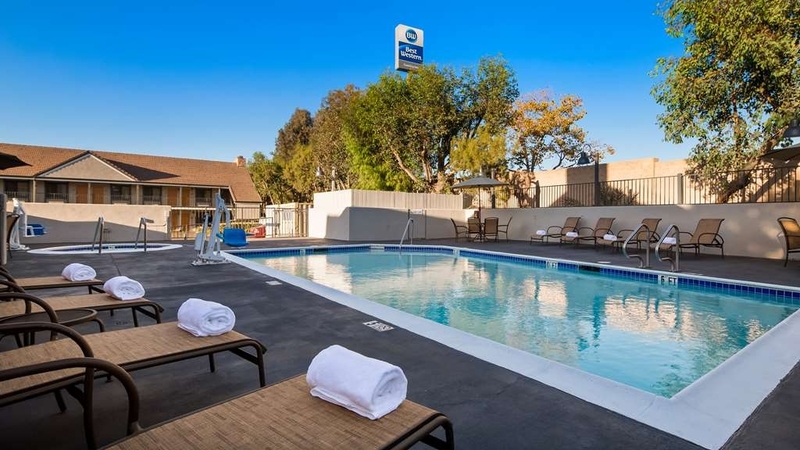 "You can't put a price on comfort"
But the Best Western in Temecula definitely gives you the most Comfort at the best price. For the breakfast it's offered the quality of the rooms and all the amenities that are offered paying $12 more than the other local hotels gives you a huge improvement over those other hotels. The breakfast is hot and has a very wide variety for anybody. The pool and spa are refreshing, the rooms are clean and fresh and very comfortable. The staff is knowledgeable about the area and goes out of their way to make their guests comfortable. This is a very good location. We arrived early/late evening, rooms available, acceptable rate. Clerk was respectful, polite and helpful, gave us an acceptable room & rate. Room was clean, linen clean & tidy. Bathroom clean and stocked. Breakfast next morning, waffles, toast, eggs, potatoes, sausage, drinks, cereal (for you strange ones, kids), well organized and fully stocked, nice dining area, lots of foreigners, welcome to you all. I'd gladly use anytime we're in this area. "Worst place to stay in Temecula "
Checked in to room 226. The room reeked of smoke and there were still ashes on the nightstand. The king bed was lumpy and had a crater in it like an elephant had been sleeping there. I went to the front desk to checkout and get a refund. The clerk told me there would still be a $50 charge. We decided to change rooms, which was a little better, at least it did not smell like a casino. However, there was a pubic hair in the tub, looked like a burnt curly fry, and long black hairs in the bed as if Elvira slept there. I'm checking out tomorrow and going to a different hotel. The worst part was my family was with me and I exposed them to this unsanitary dump. The first room we were given was dirty. Then we were given a key that did not work. The second room smelled of chemical cleaner and the bed was poorly made. The staff made several other mistakes while checking us in. We won't come here again. Again, located in between fast food establishments and pretty localized to Temecula with the bowling ally, theaters and shopping mall all within walking distance. Hotel is a bit run down and is a little on the shady side. "buyer beware". there are better places that can be found. Had an emergency (family member at hospital in Temecula), we (5 members) needed a place to stay at last minute, drove 2 1/2 hours and made reservations same night. Hotel served our purpose for convenience near hospital and good breakfast provided. "Nice and convenient, but not so nice." A bit pricey for the style of hotel. Needs some updating. Feels like a modified motel 6. Staff is friendly, and the breakfast is satisfying. Conveniently placed close to Temecula and the freeway. Just a short drive to the Promande mall. We called to make reservations at this property and said we were members of the Best Western rewards program and wanted to use our points. Clerk said no problem and informed us we needed to give a credit card to hold our room. Then upon arrival we showed him our rewards membership card. Then to our surprise they charged our credit card $150. For the night we were supposed to get free. I contacted the manager Steven Wright who said that he talked to the clerk and the clerk confirmed I did ask to use points but he already reached his quota of free rooms with points so, could not honor our request. I said if that was the case why weren't we notified of that when we called or when we signed out? I called customer service and also filed a complaint. The room was clean, and had the usual amenities. However Mattresses were tired, pillows were small and flat and not very comfortable. Rooms were very dated. Not worth $150. I am a widow and travel alone now. 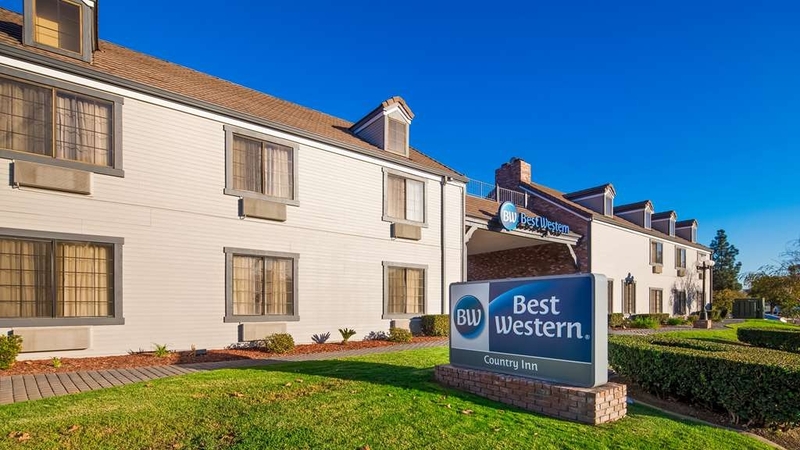 We are long time members of Best Western and I always try to find a Best Western to stay at when I travel. I feel safe there and I have not had a bad experience at any of them. Loved EVERYTHING ABOUT MY STAY- the staff, the room, the location, the VALUE!!! All amazing and exceeded my expectations! I will DEFINATELY be returning to this property for all of my work trips! So blessed to find this gem ?? We were happy to be back in Temecula and chose Best Western. The lobby was so beautiful and the rooms so comfortable. Staff were very accommodating to our needs. For sure we will be back as weather gets warmer. The location is not far from the wineries, nice restaurants, the mall, movie theaters, etc. 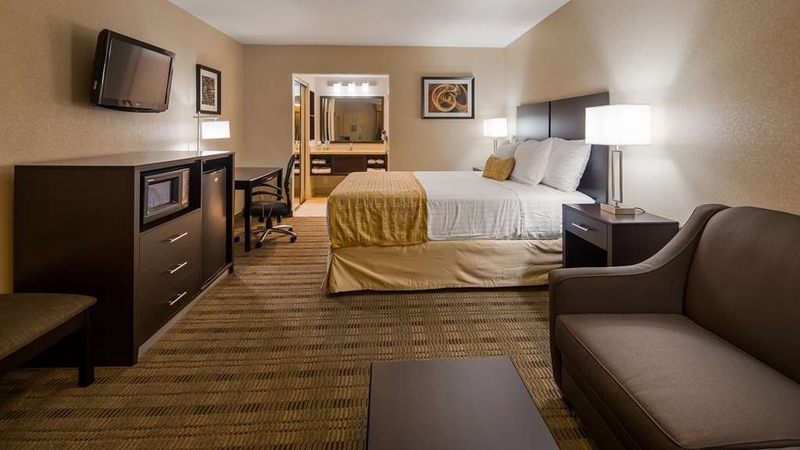 The value was there, and the hotel compares favorably with its competitors. Service friendly. Room appointments on the average side, but were fine enough. Complete breakfast offered until 10AM. Thoughtful. Definitely will consider for return. This is an average motel style property in Temecula. It is minutes away from Old Own and minutes away from the wineries. It is relatively easy to access off of I15. Breakfast was pretty good but the same each day. The rooms were clean and comfortable. Ours had a king size bed and a sofa. The hot tub and pool are open year round. We didn't use the pool but did use the hot tub which was fine. Thankfully, our room on the first elvel was close to the hot tub since it can get quite cool at night. The parking lot is a little tight so if you have a bigger car/truck/van, you might have some concerns. The hotel was a good value for the money. Bed is extremely comfortable. 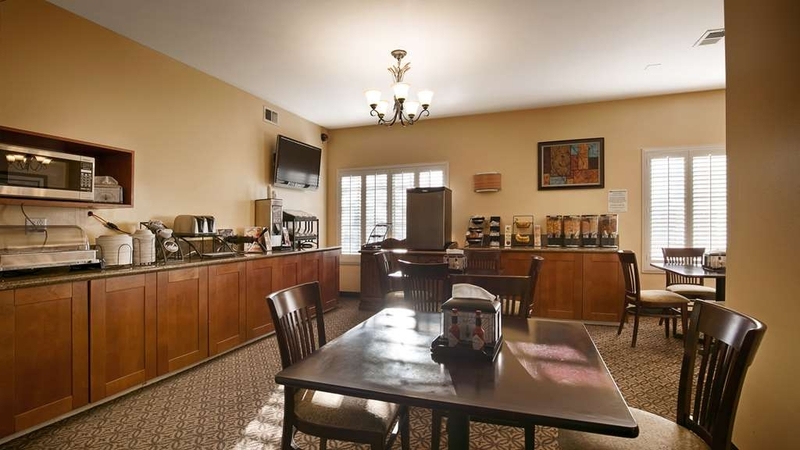 They provide a nice spread at a convenient time span for continental breakfast. The breakfast area is decorated in a cozy, comfy way and the service was very attentive. 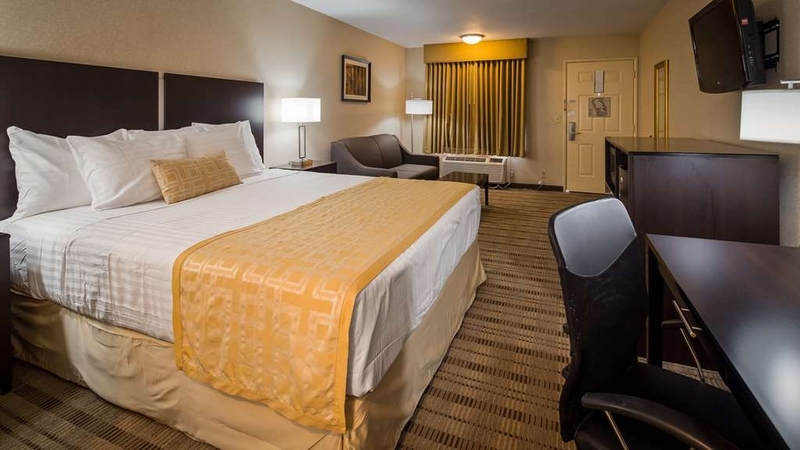 Hotel is conveniently located, easy to get to and from the rooms with plenty of parking spaces available. 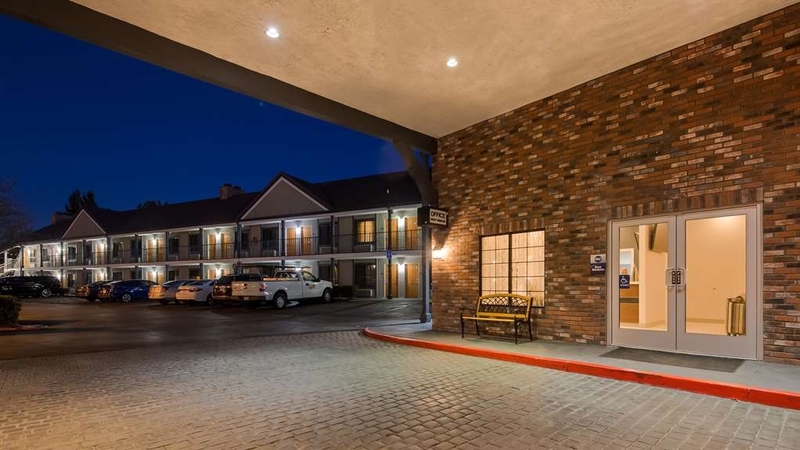 "Great stopover hotel near I-15"
Easy access off of interstate with numerous restaurants and shopping locations nearby. Visit to Old Town Temecula without getting on freeway again. Newly renovated. Wi-fi not fully operable at time of stay. Nice pool and hot tub; breakfast was satisfying with plenty of sit-in eating space. Staff courteous; parking abundant. One draw-back is that the hotel is adjacent to the freeway; requesting room near lobby should decrease noise. This is a good "stop-over" hotel, not a "vacation" hotel. "Nice Weekend Getaway in Temecula"
This Best Western is more of a motel, but is very nice and very clean. The hotel room that we had was fairly large and very close to the swimming pool and hot tub which we used and enjoyed very much. The price of the Best Western was very reasonable compared to other hotels in the area. It is conveniently located and close to Old Town Temecula as well as the wineries. "Cockroaches and Pubic Hair, oh my"
While the staff were friendly and attentive, the facilities lacked cleanliness most every time I stayed. This past time did me in with cockroaches and pubic hair, I couldn't even sleep. I reported to corporate with no response and then was charged an extra week for which I did not stay. "Nice place for an overnight stay." We had to drive 125 miles to a family birthday party for our aunt who was 90 years old and we didn't want to try and drive back on a 3 day weekend so we chose this hotel. We had stayed here before for a similar event. It worked out perfectly and we enjoyed our stay and didn't have to break the bank to do it . This is a typical motel backing on the freeway, nothing special really. It is well located near the old town if travelling by car. The room was quite spacious, and basically clean except for the carpet which needed replacing. The renovations in the reception area and breakfast area are complete and satisfactory. The complimentary breakfast offered sufficient choice. "This hotel was better than I expected"
The location was good. The room itself was nice. It was very clean and had nice amenities. The downside was the windows looked into the parking lot so the shade had to be closed and there wasn't good lighting inside. Also, the walls were very thin. We could hear cars starting in the middle of the night and our neighbors talking early in the morning. We were woken up a few times during the night because of these. The breakfast exceeded my expectations. Had a few hot items and a large selection of pastries, cereals, and juices as well. We were not informed before hand that there is construction at the hotel even though the reservation was made a while ago . Thus no HOT breakfast as advertised just a few items bagged to go. Strong smell of sewer in the courtyard at arrival. Room maintenance was neglected - light bulb missing and the fixture in the shower indicating Cold/HOT water is attached in reverse. As soon as the water is turned on steaming HOT water pours out. It can burn you pretty good if you are not paying attention. Finish construction, put more than 2 towels in each room, offer pool towels, offer water for sale in the room fridge, clean the brown stains out of the jacuzzi, & have a security guard on patrol after dark. This hotel was pretty average, but for the cost (especially considering there was construction so that the lobby was in a regular hotel room and the breakfast was in another regular hotel room, in addition to having giant construction bins and noise right outside of the hotel) was exorbitant for what was given. We stayed at a MUCH nicer hotel (Residence Inn Marriott) that was a full suite including a full sized kitchen, for less the following night. Best Western, in general, isn't bad, but considering the construction, $180 a night, not including tax, is just way too much. Centrally located, friendly staff and clean and large rooms. Free continental breakfast included. Rooms very quiet even though located near the freeway. Ample parking. No lifts though so if you have geavy bags opt for a ground floor room. See above mentioned comment about entire stay. Housekeeper was overstressed and overworked. False advertising since breakfast wasn't as described and place was under remodeling and information wasn't relayed at time of making reservation. "Well located, clean, quiet motel; avoid weekends"
We stayed Sunday through Thursday, and the price was exceedingly affordable. We would NOT stay here over the weekend, as the price nearly tripled, and that is not commensurate with the quality of the motel. But the room was spacious (king bed, sitting area, spacious bath), clean, with free wifi and substantial breakfast. Easy access to Old Town Temecula and grocery stores, although not within walking distance. There are restaurant options within walking distance, however (fast food, casual bar, Indian, Chinese). Staff were friendly and helpful. They have a full-time maintenance and technology employee, who fixed the hotel's satellite (wifi and directTV) service while we were there and, after looking at our microwave, replaced it with a new one. So well-managed. "Too expensive for a poor hotel"
This is a motel 6! Looks great in the pictures but the experience should be under $100 a night. It was almost twice that. I have stayed in Best Westerns that were far superior to this. There as no lobby. You checked into a room, not a lobby. The breakfast was substandard. Even the location was not that good. Had to have a car to get dinner. I don't know how this place got ranked the #6 in Temecula but oh well Everyone has a different experience. We ended up here after a wedding had a last minute venue change and this was one of the few with a room left. The lobby is under construction and check in was in a room, which was understandable. But then the breakfast area was also in a room which was kind of .... awkward. Eating in a room with other people, knowing that it's a room for sleep not food and what not. No thanks. The room was big but very old. There was some black stuff on the walls that I didn't touch because I didn't want to gross myself out more. Only 2 towels for 2 people for a 2 day stay which is OK I guess but I'm a girl and need 2 just for myself. It was noisy and uncomfortable. In the morning my man was like, I don't care where we go but we need to get out of here ASAP. This was just a place for a sleep and shower. If we would have paid the $240 price I would have been really upset at the quality. We used points tho so we weren't out any money, just a good night's sleep. "Always been good but much nicer after recent renovations"
As an extensive traveler (probably 1,200-1,400 hotel stays last 16 years) I can tell you the King Bed my wife and I slept in at The Best Western Country Inn ranks right in the top 5 of hardest beds I've tried to sleep on in those years. Generally I find hard beds in older facilities, but to my amazement these mattress's I was told by the front office gal were 1 year old? Now I know some folks prefer a harder mattress, but 99% of the hotels I bunk at have now moved to pillow top mattress's, so that is why I was surprised to hear these were new.. So needless to say I paid $200 per night for my wife and I to toss and turn all night on a slate of granite. 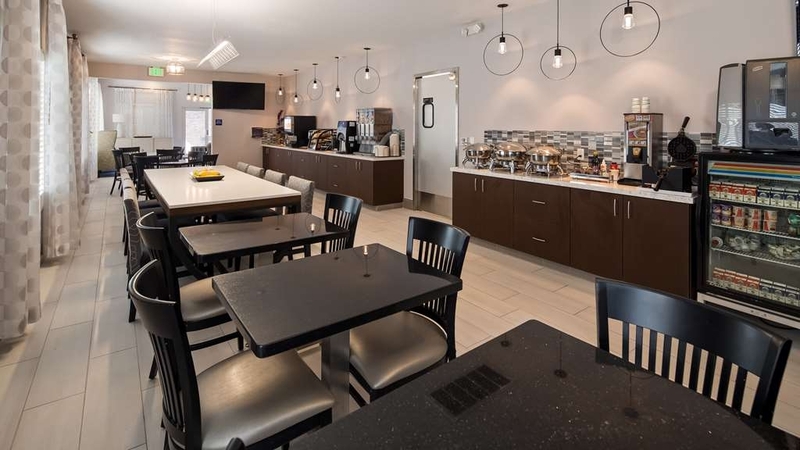 Overall the facility is undergoing a facelift so rooms were modest but ok. Be aware right now breakfast room is in another hotel room for the time being due to remodel and they served no hot food, so be ready for toast, bagels, etc. Server told us hot food was not available while the remodel was underway. I hate to complain, but if you like a very firm mattress and no hot food in the interim this is the place to stay, if not there is a Holiday Inn Express about 1/4 mile down the street. "All exterior corridors, and lack of attention to details "
Stayed here with family for a wedding at a local venue. Since I am a BW rewards member, I checked my options nearby and decided to stay here. Location was good, rooms are ok just not super clean. Not gross, just dirt in the corners of the bathroom and other details were missed. I always prefer interior corridor. Many Best Westerns offer both. As I mentioned earlier, all are exterior. Good Hotel, very good breakfast, staff was wonderful, a touch difficult to find, have to drive for flexibility in dinner fare however is fast food close, no work out room but is a heated pool. When checking in at night it was a touch creepy you had to interact with desk person through bullet proof glass that was not clean it put me off but in the day light the Hotel was actually very nice. This hotel is very close to the winery row in Temecula. Nice accommodations for overnight stay. The room was very big but it could have had another blanket available. Very convenient to stores and restaurants. Right off I 15. Went to Temecula for a visit to wine country. This Best Western was close to that and other things to do. It is a great location and week day price can't be beat. The staff was great and the breakfast made it easy to eat and run. I like quiet nights. Clean rooms. Coffee in the lobby in the mornings. Comfortable beds. And a fair price. We stayed here 3 nights while we ran around De Luz, Fallbrook, Carlsbad, and San Diego. A few days respite from high desert heat. Serve a breakfast in the lobby. It was better than some hotels offer. All in all, it met our needs more than adequately. 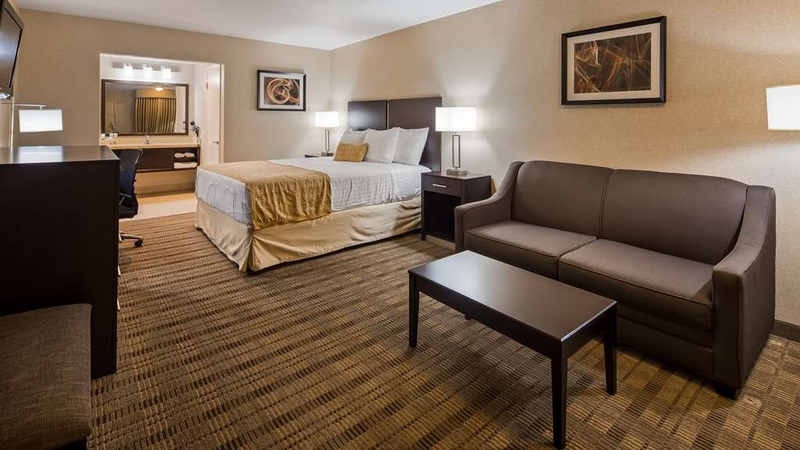 This is the best, value priced hotel near the casinos! I go to Pala casino to indulge in their buffet maybe twice every year but I hate that I can't stay there since their nightly rate is expensive! The drive to Pala is also long for me so the best option is to find a local hotel. This is your best bet! 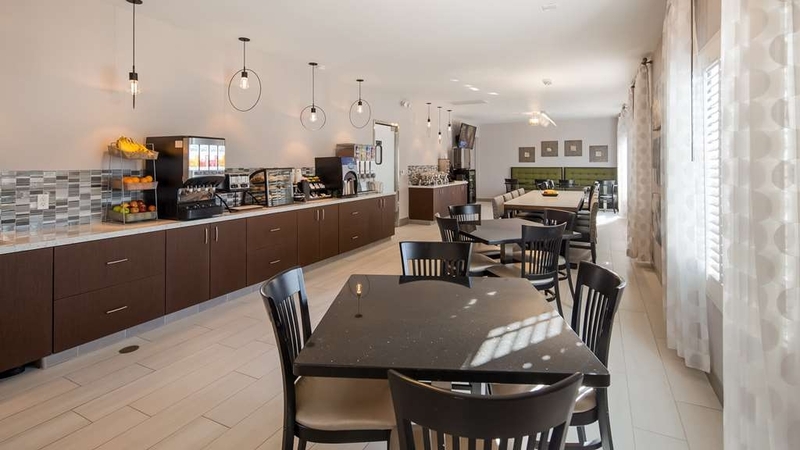 Free breakfast, parking, wifi, with a unbeatable price! I don't understand why people pay so much money for a room they will be in for less than 24 hours. The place was quiet and clean, the only problem is that the beds are firm, but that's just preference. I will be back! I probably wouldn't have been at ease and comfortable If it wasn't for Taylor who works at the front desk. I told him I was going to be staying for the next 2 weeks and was also going to be working from my room, so I told him I wanted to be comfortable as much as possible. He took good care of me for the 2 weeks I stayed. I know now the next time I stay in this hotel which room to request/reserve. Because of him, I now have a favorite room He was very professional, friendly, and courteous. Much Mahalo TAYLOR!!! The great thing about this hotel is that it is near everything from restaurants, gas stations, Old Town Temecula, movie theatres, ect. The down side is that my room never got cleaned by the cleaning staff when I took the "do not disturb sign" off the door knob first thing before I left for work. We stayed just one night as attending wedding up the road. Hotel was easy to find, just off the freeway. Room was large with very comfortable king bed. Bathroom clean. Tea and coffee in room. Nice selection for breakfast, scrambled eggs delishious. Staff friendly and helpful. Traveling back to Mexico. We have BW rewards and found this hotel after a long day of traveling. The room was very large, the king bed very comfortable and internet was fast. We left at 5am, so did not have breakfast before we left. If in the area, we would stay here again. Jose was our desk clerk. Very accommodating. "Ants go marching one by one...."
The staff was nice and the rooms are clean. This location is not far to Old Town which was wonderful! The only downside to my stay would be the unwelcomed ants. I saw a few when I checked in and I made a call to the front office to bring attention to the situation. I woke up with the ants everywhere! Next time I will bring my own Raid... That being said, I stayed there in mid July, which I understand is ant season in Temecula. Good hotel . Very quiet at night. Rooms are very clean. But went to the counter this morning inform them several things that need to have maint service in our room today all minor, light bulb , fridge not getting cold,toilet runs off and on... So when we got back tonight nothing was done. That's why they didn't get the fifth star. "Good location, older style motel, still great." This was our first accommodation after arriving in the USA after a 14 hour flight. It was our recovery location for a few days in Temecula. We arrived mid morning and a room was available, so the staff were terrific and let us check in early so that we could spend some time recovering before embarking on exploring the area. The hotel may be a little tired but is clean and tidy, well maintained, beds are comfortable, breakfast is usual - good quality. Well worth a visit. My husband and I stayed here for one night earlier this week. We had a minor issue in our first room. Graciously, Jose at the front desk gave us another room. Both rooms were clean and well-appointed with larger than average refrigerators. The nearby freeway could not be heard. The eggs, potatoes, and sausage served at breakfast were tasty. We haven't stayed at a BW before but we'll be looking out for them for future stays! "Great Stay for a busy football tournament"
We were in town for my sons football tournament and it was a busy 4 days but the hotel was everything we needed. The rooms staff and pool worked out perfectly. The staff was friendly and helped with anything we needed. Thank you for a great stay. 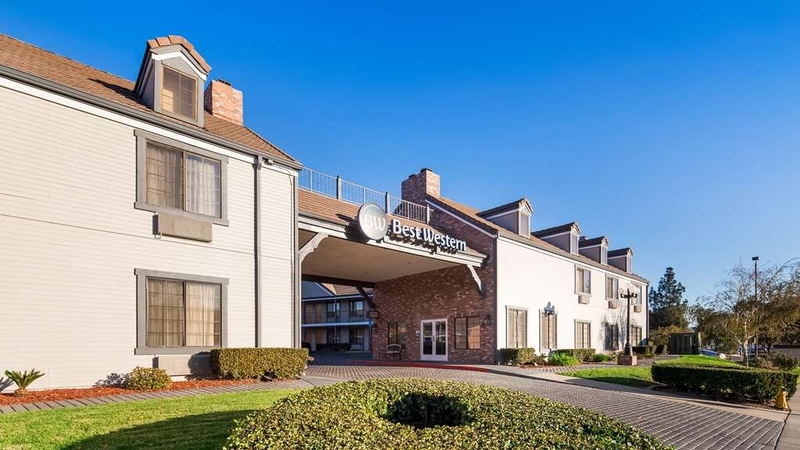 "Best Western Country Inn Temecula Great Experience"
The Temecula Best Western Country Inn is a great place filled with friendly staff, a clean and welcoming lobby, hot breakfast and newly renovated rooms with a contemporary look to fit today's modern standard of living. It's central to Old Town Temecula as well as the Promenade Mall and nearby restaurants. The Location of this Best Western is awesome. It is a stop for Grapeline win tours and it is so close to Old Town Temecula. Property is very clean and rooms are very spacious and nice. I will continue to stay here when I come down to visit Temecula. I love the Best Western Brand and this hotel did not disappoint. Would recommend this hotel for couples, families and anyone looking to relax in a comfortable and clean room. The breakfast was good, however the area in which it is served is small and cramped. "Great overall value and experience!" Friendly Staff, clean room with all necessary ammenities and a great value!! The breakfast was great and included fresh orange juice, coffee, waffles and eggs. Free internet worked great and without a hitch! We will definitely return! Our room was nice and very clean. The bed was comfortable. This hotel was very convenient to go to Temecula and the wineries. The breakfast was just the typical breakfast served at hotels. Out room was by the main street. However, it was quiet in the evening. There was some car sounds in the morning. "Terrible levels of motorcycle noise"
7:00 am, old harley with straight pipes revving outside our door, for a long time. Joined by two dozen others, revving in the parking lot. It was horrible. We were there for a wedding and all the guests who stayed at this hotel were UPSET! Also, the room was not straightened up after our first nights stay. Not sure why. Good hotel. Waking the night host for late check-in was challenging. Hotel breakfast was adequate but nothing to brag about. Rooms also adequate.good for a one night stay. I would not want to stay a week. Bikers reveing motors at 06:30 am was not pleasant. 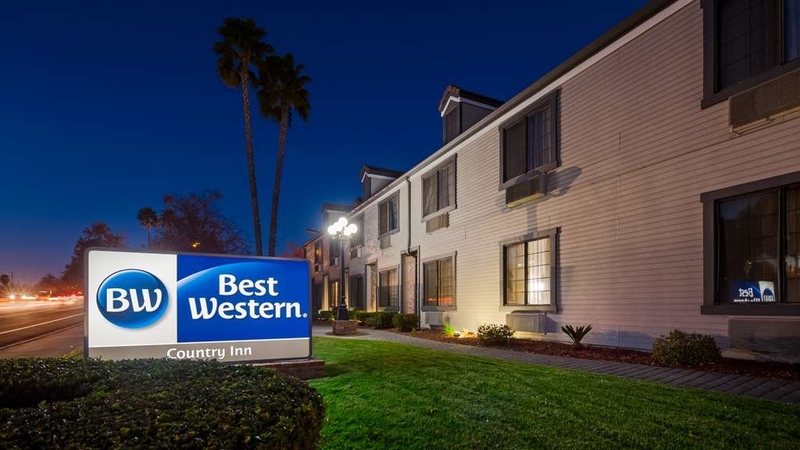 This Best Western is conveniently located near Temecula Wine Country and provides basic, but convenient, clean, and comfortable rooms. They also have a jacuzzi and pool and offer an extensive, free breakfast. The staff is friendly and accommodating. The price is reasonable and what you save you can spend on wine tasting. I highly recommend staying here. Good hotel choice. Accommodate quiet room. Satisfactory breakfast. Surprised at hotel prices in Temecula but it is just the way it is. We have stayed here about 4 times now and would return for another stay. That's it! Unfortunetly we were deciding which hotel to stay at and were deceived by the pictures, cleanliness of room and pool were not satisfactory and we are not a picky family. There were kids partying upstairs until 3am and went to call front desk and phone did not work. "My Beautiful stay in Wine Country." Great stopover after some good wine tasting. A very comfortable room and spa to relax your bones. Recommend it to all. Liked the new upgraded look the motel received since my stay almost 4 years ago around the corner from this motel. I had a great stay and affordable. The appearance was very clean. The breakfast was decent, and it was always hot. There was also a large variety of cold food available as well. 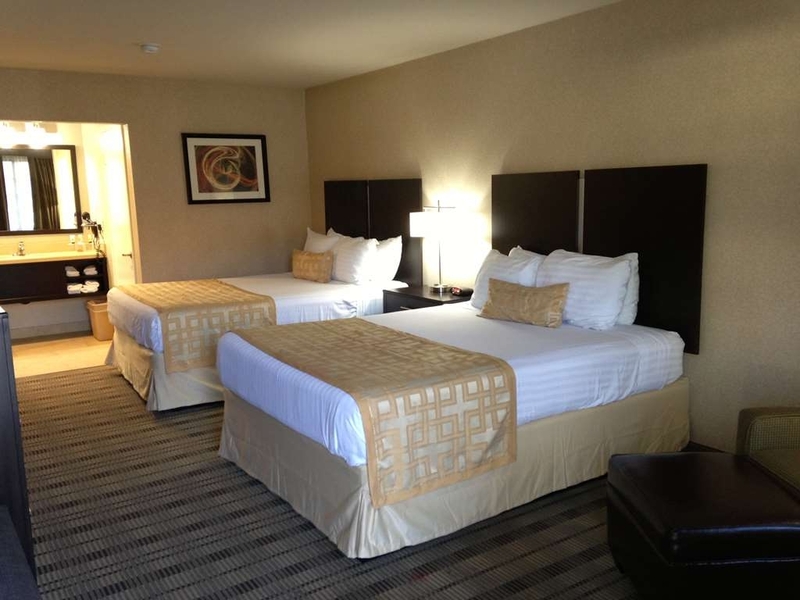 The staff was very accommodating with my changing plans and the room was very clean. The location is great as it is right outside downtown Old Temecula City and very close to the wineries. It was a pleasure staying there and I would happily book there again. Nicely remodeled with lots of room and a properly heated pool i.e. 84 degrees. Staff were friendly helpful. Breakfast included eggs and sausage which is much better for gluten free than continental. They even had a gluten free cereal if you asked. Air conditioning was good but I wish it didn't have 2 degree increments i.e. 72 or 74 but not 73. Quiet considering the street is close by. 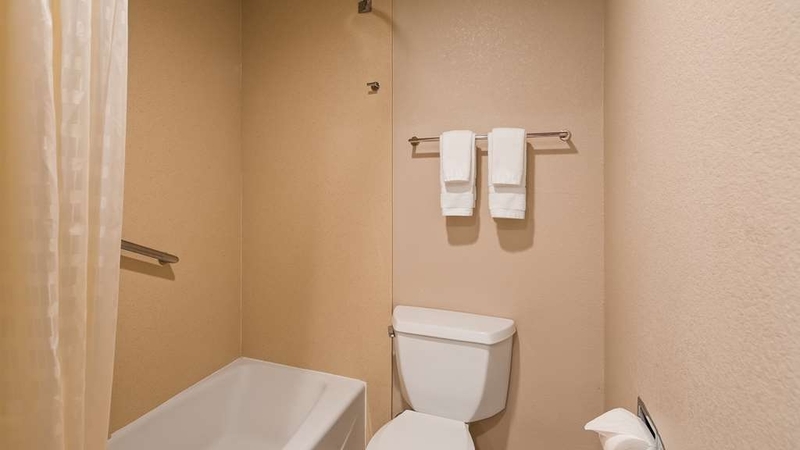 "Professional staff, good location, enjoyable amenities"
The room itself was extremely clean, comfortable and the amenities were great but unfortunately we found a huge roach in the tub. I'm sure it's because they're outside access rooms. A bit more detailed pest control should help. Other than that we highly enjoyed our stay. Very nice property, well maintained and clean. entry from the highway is through a portal and opens into a large parking area surrounded by the U-shaped building. Staff was friendly and efficient, but the afternoon desk clerk was not familiar with where the senior center in Temecula was located, but I did find it. Room was clean and well laid out. I did not use available wi-fi. Request a room away from the road, night noises were a bit bothersome. "Stayed on the way to Anza"
Good clean room to stay the night. Refrigerator and coffee maker. Basic amenities. Clean comfortable stay. Waffles for breakfast and good enough coffee. Good size modern TV. Just spending the night on our way to see the flowers in Anza. This was a great place to stay. It was clean, staff was great, and our room was perfect. The beds were very comfortable as well. I will be sure to recommend this hotel to others. A great experice and will give it a 5 star rating! The hotel was good place to spend our Thanksgiving weekend. Our room was very nice and comfortable. Breakfast was very satisfying and the staff was nice, The hotel was in a very quite area and restaurants were very local. This hotel was the cleanest hotel I have ever been in no musty smell at all no hair no mildew. The bed was comfortable the pillows were soft and fluffy and smelled fresh.the staff was courteous and helpfull with directions the pool and spa were very clean .The breakfast was awesome they had had everything you could want eggs bacon waffles yogurt fresh fruit oatmeal and bagels. I will definitely stay here again. "Best Western is great, but this one has management problems"
We were not familiar with the area, but knew that Best Western was a great chain and pet-friendly as well. We loved this place. The clerks were great, as were the room and amenities. The only problem arose when I had to take my suv in for emergency repairs and my wife was left at the motel, a couple of hours prior to check out. The car repair took longer than expected. Other places we have stayed have given us late check-out times with no hassle. This place was not so. She was locked out of our room automatically (key card programming) at 11 am. This is unacceptable service. Then she had to beg to get back inside to pack up our belongings by herself since I was stuck at the car dealership -- repairs took longer than expected. My wife stressed out due to extremely poor management practices and NO customer service. I arrived just before noon in time to load up and leave this nice motel with absolutely horrible customer service. I would not stay here again, nor recommend it to anyone, without the assurance that management had been replaced with caring people or that this ridiculous policy had been changed. Temecula is a great town -- but the management treated us like homeless people that they wanted to get rid of asap. A= for the basic motel, F- for customer service, giving a "C" rating overall, except that the F over-rode all othe ratings. Caveat emptor!!! good location, clean, rooms are comfortable, there is a free breakfast , reasonable price. near the freeway. Have a good space of parking lot, that was remodeling the time we were there. the Swimming pool could be better tho.. in general is a convenient hotel to stay. "A very clean and enjoyable stay"
Nice motel with newer rooms. Very Clean. Nice pool and spa. Parking good. Breakfast very good. Services good. Close to old town Temecula and other shopping. Only complaint is after staying here 3 times, you can still here the people next door talking and the TV going, if they have it to loud. Would like to see them do something about that next time. Other than that, I would recommend this motel to anyone wanting a good place for a good price with breakfast. 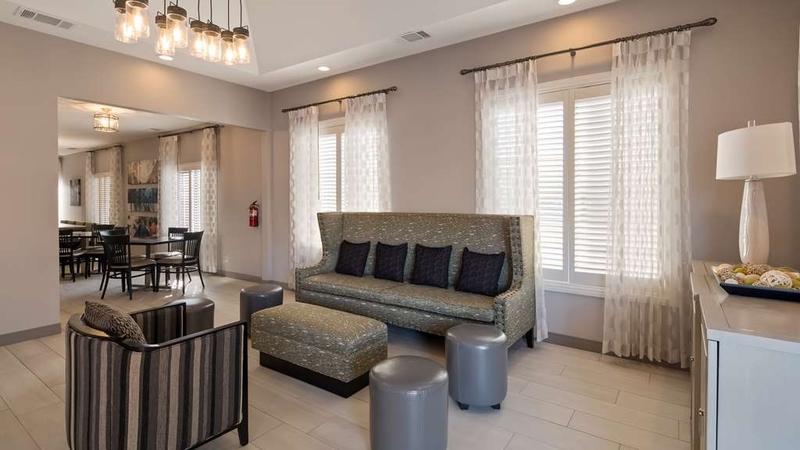 I chose this hotel for the price and the convenience of it's location near Old Town Temecula and the wine country vineyards. The friendly hotel staff accommodated us with an early check-in. The room was large and very clean. The pool area was great and in fantastic condition. The price was very good for this area and the breakfast in the morning was your usual buffet style for this type of hotel and actually pretty good. The eggs were hot, the waffle maker provided a really fluffy waffle and the coffee was delicious. I would recommend this hotel. Unlike most Best Westerns this one is not dog friendly, but they did accomodate my service dog cheerfully. The neighborhod is nothing special, busy street with fast food etc but the property is attractove and the room was large and well appointed. It's not as close to Old Town as I hoped, more driving than walking distance. Nice place, no complaints! Business or pleasure the best place to stay at a reasonable price is the Best Western in Temecula, CA....Ask for Diana at the front desk as she accommodated our need for slightly early check in, you will most certainly want Room 225 if you can get it and the breakfast beat Patsy's down the street. Close to Old Town, 15-30 minutes from most Winery's. Close to many restaurants. Staff friendly, breakfast better than most, classified as continental, but included hot foods and food tasted good! Large King room with sofa. Clean. Would stay here again. Only complaint was air conditioner was noisy, but did not ruin our stay. Did not use the pool or Jacuzzi, but pool area looked clean and included chair lift for handicap at both the pool and the Jacuzzi. 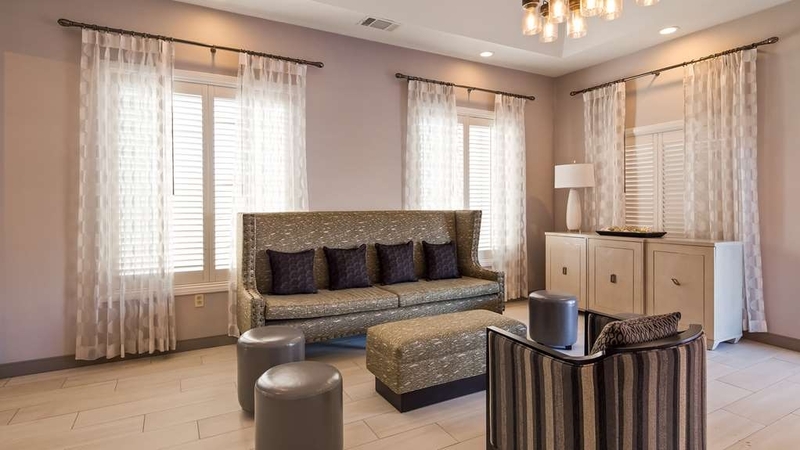 "Best Western experience in Temecula was wonderful"
When we got to best western a few hours early we were going to leave our vehicle and head out to the winery's. We asked if we could leave our vehicle and the staf was very nice and got our info since it wasn't time for check out time yet, we were even given cold water bottles which was very nice concisering it was a hot day. Later that day we checked in and entered our room which was very nice. Has a desk, sofa, king size bed and a fridge to put our own stuff. We were able to watch cable and walking distant e to a nice restaurant. Also, very close to old town Temecula and not to far from the winery's. And let's not forget the great bread eat they provided, the cool part was that they had waffle mix and I was able to make my hubby a fresh waffle and by the way we will now purchase our own. "Clean, easy access from freeway, great staff"
We were looking for a good nights sleep during a stay for a wedding. Everything was clean, worked, staff was efficient and very helpful. When we arrived we were behind schedule, and the check in clerk quickly printed maps for us to all our venues, suggested a great new place to get good coffee, and processed our checking in very quickly. This motel is so convenient to wine country and a great value. We stayed there for three nights. The rooms have been newly renovated. The bed was super comfy. The breakfast that's includes is pretty darn good except eggs and potatoes are usually cold. Wish there was a microwave in the breakfast room to heat them up. We were pleasantly surprised at the variety of choices and they had all the condiments, hot sauce etc. The desk staff were good to deal with. No problems there. The only problem we had, and it was a pain, was the TV situation. The remote wouldn't work with the TV. Had to have someone come numerous times to turn the darn thing on or change the channels, weird and inconvenient. We didn't use the pool or jacuzzi, so can't comment on them. Other than that, great stay at a great price. "great place i the wine country"
Perfect place to stay while visiting the wine country. They have a wonderful breakfast with lots of choices. The hotel is at the bottom of the road up to many of the wineries. It is also very close to Old Town Temecula- another great place to explore and visit. Great hotel, great staff. Excellent breakfast provided. Hotel clean and tidy, room comfortable. Easy to find, right off Interstate 15. Close to Old Town Temecula and not far from the Pechanga Casino. A variety of fast food restaurants within walking distance, and many other options available with a short drive. We were welcomed in spite of being very late to check in. Our room was so clean and smelled amazing. Quiet and spacious. I highly recommend this Inn. The breakfast was delicious with plenty of everything. We even got a friendly late checkout. Thanks for the great stay. Don't let the exterior of this hotel sway you. Inside the rooms was modern, clean and a very comfortable bed. It is right off the highway, but we couldn't hear it. Breakfast was great! Lots of options and even the coffee was good. The room was clean, updated and comfortable. It was also quiet and bigger than expected! We were in town for an event and our usual hotels were sold out. We gave Best Wester a shot and are glad that we did. We hung out by the clean pool for a little while before getting ready for our event. After the event, we slept well in the extremely comfortable bed! The room was silent. Breakfast was a nice bonus. I'd stay again. "Mostly clean and comfortable, a few nit picky complaints"
I stayed 3 nights at the hotel while my house was being fumigated. The front desk staff at check-in and check-out was very friendly and helpful. At first glance, everything in the room appeared clean, comfortable, and in working order. My complaints are more annoyances and major inconveniences, but deserve a mention. Breakfast was advertised from 6-10 am. Two of the three morning I stayed there, I was hoping to eat right at 6:00 am and was disappointed to walk over a few minutes after 6:00 and see several people standing around waiting for the door to be opened. Once it was, I found that the person in charge of putting breakfast out was still working on bringing out the warm items. There was also a large group of men working on a local construction project staying at the hotel who needed to eat breakfast early before heading out, so I ended up taking my food to my room to eat as it was a bit unappetizing to be in a small room with a bunch of men who smelled like they either hadn't showered or been able to launder their clothes between days on the job site. Water pressure in the shower was about the worst I've seen in a first world country and the hot and cold taps were mixed up so if this is their way of saving water it didn't work out too well as I stood around for quite awhile waiting for the water to warm up before realizing this. Once I did get warm water, I still felt cold standing in the shower because there was just a trickle of water coming out of the shower head more than a foot above my head (I'm 5'8" so I'm not just vertically challenged). I didn't have any noise issues the first two nights aside from a truck arriving around 4:00 am the second morning that seemed to make quite a lot of noise for a good 30 minutes or so. The third night a family was staying in the room next to me and I realized how thin the walls are. Fortunately there weren't any small children crying or yelling, but I could hear every word of their conversations. Wifi was adequate for streaming video on my iPad but not for hooking up my Apple TV to watch it on the big screen. Might not be an issue for some people but it had me a little bummed out. Being from the area, I know the location of the hotel is pretty safe, and there's not enough going on at night for it to be too noisy, even being right along the freeway. Very clean, comfortable beds. The breakfast they give you is very delicious they have a variety of food not like other places that only give coffee and donut or bagels. Staff are very friendly and helpful. 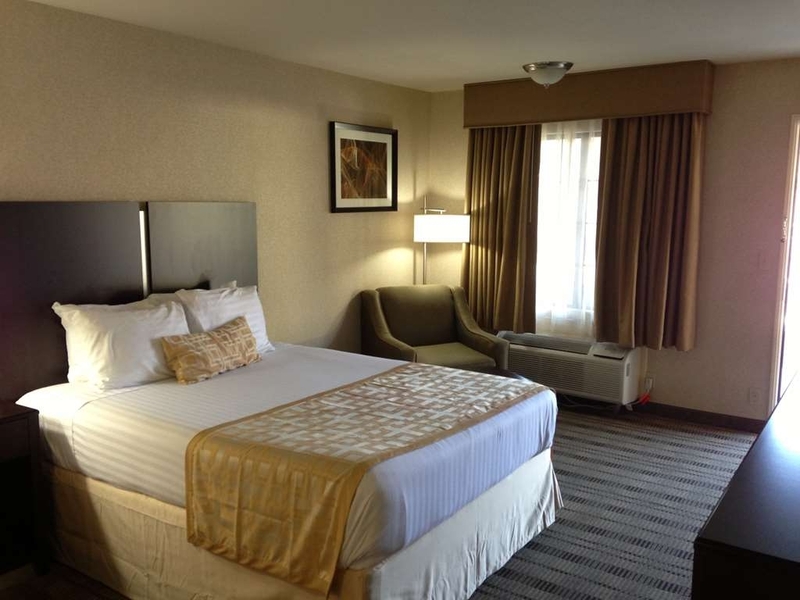 The room was super clean, smelled good, overall really satisfied with the hotel. The room had plenty of space, the beds were comfortable. Great prices and breakfast is a plus. I would stay here again! "Motel style rooms, good breakfast. " Rooms are very spacious. We arrived early & were granted an early check-in, which was excellent. We were able to check in early, get the 3 kids with us into the pool & relax a bit. The pool is a little less than we'd hoped for, and only 5 feet deep, which is hardly large enough. Nonetheless, kids enjoy water, and enjoyed this water. The major downfall of the pool is that it is right by the dumpsters for the hotel, so it stinks while you're swimming! The breakfast is fantastic and I was full until well after lunchtime. I had bacon & potatoes, yogurt, a bagel & guava juice. A waffle maker is there too! We really enjoyed our stay. We were there to celebrate birthdays and go wine tasting. The location is perfect for our needs, we could go wine tasting and then have dinner in old town. The rooms are well maintained and the hot breakfast hit the spot. "Clean, Convenient and Perfect For a One Night Stand"
The King Bed room had modern decorations and amenities. Nice flat screen TV, functional bathroom and comfortable bed. No complaints with breakfast that was included. Hot scrambled eggs, bacon, sausage and potatoes. Flapjacks and cold cereal, with coffee and juices. (Tuesday August 9) we're still here for our last night. the room is clean. internet works. power was off for a couple of hours our first night but whatever. hair shampoo and CONDITIONER were provided. I'd forgot to bring my conditioner. My bad so I was happy to see that the motel provided conditioner. my complaint is that our room wasn't cleaned the first night and when I asked for shampoo at the desk, they didn't have it. conditioner? forget it. and I had to go to the office again to get toilet paper. and luckily we didn't throw our towels onto the floor so we could use them again. the girl at the front desk didn't seem to care that there was a problem. everything about the room was fine. the staff's attitude was offensive. we may stay here again but it's not our first choice. sad because the tariff is good. We enjoyed our stay at the Best Western hotel, Temecula Ca. Very close to shopping and the wineries. Visited three wineries and had a wonderful time. Weather was great. Very relaxing. Had dinner at the Gambling Cowboy and had a great dinner. Little pricey but excellent food and nice décor. Had a short wait even though the restaurant was crowded. Had a great time. "Needs property and service improvements"
Swimming pool needs to be heated, get rid of ants in the room, more ice machines, more experienced people at the front desk to handle people and problems, overall facility appears to need upgrade, get rid of smell by the swimming pool. It appears that this facility is trying to cut corners and save money (not customer satisfaction oriented). "Third time here- maybe the last"
I would rate our first two times here as 4 stars. This time, not so much. The clerk at check-in was not very friendly-not one smile. She did not have a name badge, or else I would have called her out here. Our room (203) was nice and big, we liked the refrigerator and microwave. However, the TV did not work. We called the front desk, and someone came within 5 minutes! That was great!! He was not able to fix it, so he changed our room to one just a couple of doors down. That was fine, except the window had been left open, and with the heat of the day (and the power outage the night before), the room was so warm, and it took the A/C a long time to get the temperature down. I noticed the window was open when we were first opening the door to go inside, why can't the housekeeping staff notice it??? Plus, the last two times we stayed here, the free wifi password was given to us upon check in, and this time, we had to call for it. Not a huge deal, but a noticeable difference. The outside carpeting over the stairs and upper walkway is badly stained, maybe that should be removed for a different floor covering? You can't beat the price, but we think next time, we will pay a little more and try a different place. "Great breakfast but not so great staff"
The room was clean and comfortable and the hot breakfast was wonderful with scrambled eggs, bacon, waffles, fresh fruit, yogurt, cereal. It was the best part of the stay as the front office staff was rude or indifferent. They seriously need to take customer service classes. Then the last night of our stay the electricity went out. It was so hot in Temecula, CA and we could not stay in the room with no air conditioning overnight. Thankfully we had family in town as all other places to stay had no vacancies. It was strange as places next door and across street had power so don't know if they didn't pay their bill or what. The pool was nice and they kept it clean. Be sure to get a room away from Jefferson St. as the walls are thin and the sound of traffic will keep you up at night. Unfortunately the downstairs accessible rooms are by Jefferson street apparently. 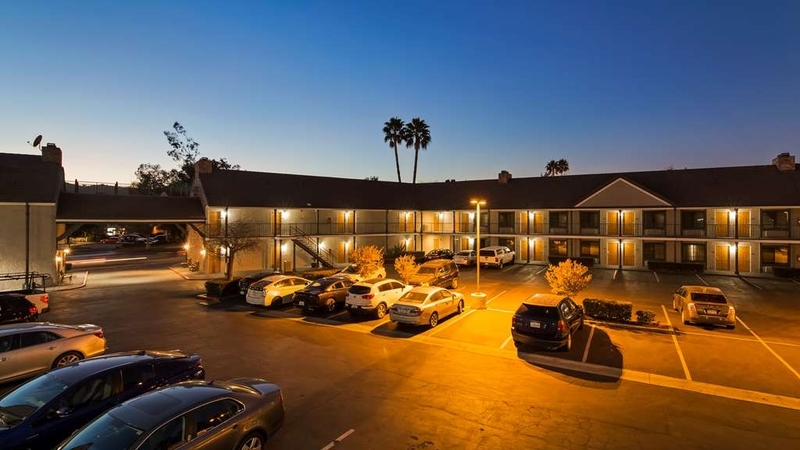 "Very close to Front st/Old Town "
Nice Best Western hotel, within a mile or two of Old Town Temecula. Easy access to I-15. Rooms are standard "Best Western ", larger than other comparitively priced ones, clean and modern Breakfast better than most other Best Westerns. For the price, a good value! Very typical, comfortable and convenient location. Nice pool. Only issue is that the bathtubs DO NOT have any non slip adhesive or mats to prevent slipping and falling. Took two showers and slipped both times due to bottom of tub not being flat and having NO mat like adhesive. Relative in next room just had knee replacement and could not use the shower due to the slipperiness of the tub. I'm giving it a poor, but some things were good and some were not. Good - breakfast - much more than continental - eggs, bacon, potatoes, make your own waffles, fruit, yogurt, oatmeal, fruit, whip cream, cereal, coffee, juice. The room had a larger mini refrigerator, microwave, pretty good shower. Bad - bathroom smelled musty, pool was closed when we arrived, but opened the next morning. I might have changed hotels ahead of time had I known this. My kids really wanted to go. Then the pool was cold the next morning. I could hear people above me walking around from 3:00am - 4:00am. It was so annoying. The AC in the room is so loud I couldn't sleep -I'm a light sleeper, but my husband who is not also had trouble with all the noise. I don't think i will stay here again. Accessibility to I-15 and too many dining options within a mile radius of the location.Just 40-45 minutes drive to SD Safari Zoo and Oceanside beach which were not bad at all.We'll definitely booked there again with BW next time we take a vacation in SD. We got up early and expected breakfast at the 6am scheduled time only to find door locked, lights off. About 15 min. later staff arrived, turned on some of the lights, and unlocked door. Then only cold items and coffee were ready. Hot food was put out about 20 min. later. Finally they turned on some more lights. Staff obviously arrived late. No apology until we complained at check out. This plus faucet issue (only hot water), uncomfortable bed, noisy AC and loud street noise will keep us away in the future. Not up to BW standards. The grounds were nice and clean. Room décor was modern and clean. The hotel building is a bit outdated. The staff was below average. They were less then friendly, but not entirely rude either. The breakfast area was clean and well stocked. In town for drum corps, what else?? I rode in the night before I was to work and stayed here. Went to the volunteer housing and it was FULL, so I came back here to stay the rest of the week. The rate was cheap enough for me to do that. $67/night on a weeknight. I was THRILLED. The more I stay in small motor inns like this, the more I stay away from the more expensive, hotels and resorts. If you ask me, the more you pay for a hotel, the more of a pain in the rear it is. I love parking at or near my room door. I love that I don't have to mess with a valet. I love that I don't have to schlep my gear across a parking lot, through a lobby, up an elevator and waay down a hallway. OK, this hotel is nice, clean, cheap and friendly. The parking is away from the street inside the property. Arby's, McDonalds and In and Out right next door. A nice area of Temecula, which btw, is adorable. I wish I had time to spend in the Old Town. This hotel is not far at all from Old Town and on that side of the highway. The other side you can find all the shopping and stuff you'd want. I paid a fairly low room rate and stayed for 5 nights. I checked into the 1st room and after I unpacked all my items and wanted to relax and watch a little TV found that the TV did not work. Then had this room changed and had to repack and unpack to the next room. This room the toilet kept flushing non stop (what a waste of water) but I did not care because I was too tired. I complained to the front desk and they said they will take in a complaint to fix it. Stayed 5 nights and this was never fixed. The cleanliness and breakfast was fairly descent and the reason I stayed on was because of the affordability of this hotel. Very good, the staff was very helpfull and friendly to us in our time of need. We stayed there because it was late and my grandson was take ill very suddenly. I would stay again in a heartbeat. We stayed for 2 days and all was very nice. The breakfast was great for us as we didn't want to take time to go out. Stayed here for a week during summer and don't have any complaints. Beds and pillows were comfortable and the room was air conditioned. The blinds were able to keep the blaring Temecula sun out. Breakfast was had plenty of options, but none of them were great. Coffee was cold by the time I got to it. Enjoyed our stay. Reasonable price. Good breakfast. Comfortable bed. Helpful staff. Great location. Booked hotel through Expedia. I was on the upper level at check in, the desk supervisor made sure I could have a lower level. They were moving new furniture in the rooms. Should look even better when we stay there again. The service was excellent. The room was amazing, spacious and well equipped. I was there for three days and would stay there again in a heartbeat. Great job! The breakfast was decent - I only had it one day because the rest of the time I went out. All in all it was an excellent experience. This hotel is in the process of remodeling. It sits near downtown Temecula and all of the wineries, making it very easily accessible for their guests. Great access from freeway. Also offers breakfast and internet access. "Best in the West "
West stayed here for a weekend get away and was not disappointed. We have stayed at other best Western and was always satisfied.. This one was the best. We had a sofa and the room was large. The staff had the foresight to keep us away from the wedding party that was also there. We had complete privacy. The hot breakfast was really good lots o variety..
"Nice place to get some rest"
Very hospitable staff. Nice breakfast in morning. The staff has allowed me more than once to check in early due to my scheduling needs. Very easy check in and check out process. I plan on staying here weekly for my work these next few months. "A/C and lamp didn't work, room smelled musty"
I wouldn't stay here again. Not only was it not at all worth the money, but the room smelled musty, the air conditioner did not cool, or stay on, and one of the lamps was broken. At about 2am I was awakened by a noise on the balcony outside my door. I opened it up and there was an overly made-up woman walking by, wearing only pants and a bra. She giggled then got into a cab. I stayed here after a wedding held nearby. This is the only hotel I found that will accept a one-night stay. Most hotels in the vicinity requires a minimum of two-night stay so booking online with the other hotels will simply show: "room not available on selected date". BW offer 10% senior discount (55+) but it is tricky booking online. I need to use AARP rate to get the discounted rate, but all you need really is your ID at check in since I am not an AARP member. This hotel is just a regular run of the mill BW. 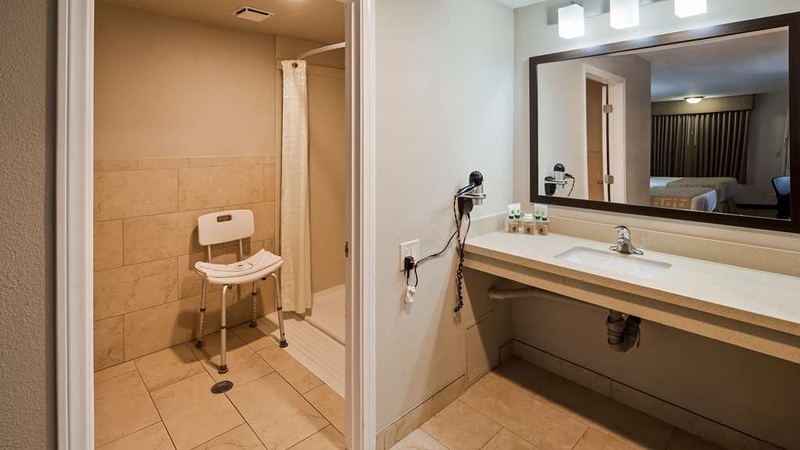 There is no towel rack inside the bathroom, just a clothes hook. Complimentary Wifi and breakfast is a must for me and this BW has them. I like the waffle maker, yogurt and fruits on top of the American breakfast they offer. This location is just a short drive to a Filipino bakery/diner that I had lunch and grabbed some ethnic delicacies I crave for. 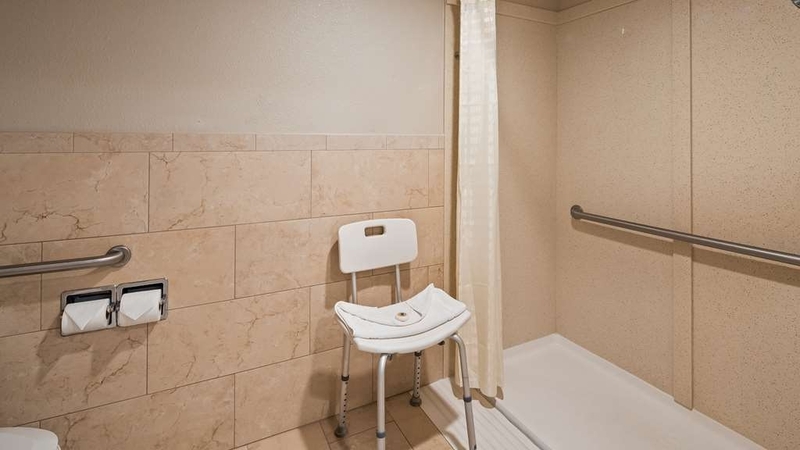 "No grab rails in shower, slippery tub surface, dirty towels in bathroom"
This place needs to resurface the tubs and install a handrail in the shower. I was careful but stillI slipped and hurt myself badly. Dirty towels left in bathroom. Management was told and did nothing to try to help. Average place for a high price, decent breakfast. Finally, this BW had no room smell, finally didn't have to suffer being in the room. The room was spacious and very nice shower. However, this BW I say is below average because: - The desk didn't have Ethernet port and power outlet for your cell phone - No elevator so had to walk up stairs with heavy suit cases - They could have installed a towel shelf above the toilet, so that clean towels is accessible after taking a bath - Not much customer service; was not greeted during check in One night I came back to my BW to find parking was full, I was afraid there was no more parking, but to my surprise I got the last parking stall. I wish the front desk informed me of such possible problem, so customer like me know what to do in case it gets full. The front desk knew of the parking problems, and not informed me. If they resolve these CONs, definitely it would be a better place to stay. My daughter and her boy friend had a reservation for one night on May 1st, when arrived at the hotel they encountered one of the guests in his boxers outside covered with tattoos banging on the door and yelling at his girl friend/wife to open the door. When they tried to check in the person at the counter was rude, didn't even care for their presence as a customer and just simply told them "the check-in is at 3" come back then. They both felt unsafe and uncomfortable with the entire atmosphere at this Best Western and decided to forfeit their $90 that they had already paid and look for another hotel. Luckily, they were able to get a room at Holiday Inn without any problems were able to check in and get their room before noon and received a great welcome and service from the staff. I like staying at Best Westerns because I can count on a clean room and the right accommodations. The reason I give this one four instead of five circles is because the room looked like it needed a little maintenance. But it was clean. They have a free breakfast included with your stay from 6 am to 10 am. "Clean & Affordable for the Area, Best for a Short Stay"
Stayed following a friend's wedding at the nearby Temecula Creek Inn which was sold out for the night. The Best Western Country Inn was more of a converted roadside motel, not the nicest looking Best Western, but the inside is much better than the outside. My main complaint would be the front desk staff - not the greatest. At check in, our receptionist didn't make eye contact and barely spoke. At check out I had to request a receipt as the desk staff carried on personal conversations. The hotel is right off a main road, so a little noisy. Perfect if you're just stopping through for a night, not sure I would recommend for an extended stay in the area. Clean and affordable for the area. This motel is in a great location. Very close to some excellent restaurants and near Old Town Temecula. Not too far from wine country. It is a very clean motel with outside doors for entrance to the rooms. The rooms are decent sized, but the King bed was too hard. It had a fridge, coffeemaker, hair dryer, and decent sized tv. Very quiet. I had the outdoor heated pool and spa to myself. Each day I used them and no one else was there. The pool & spa were very clean. The staff was friendly. Although there were eggs, bacon, hash browns, and waffles available for breakfast, the food was not hot and the hash browns were rather soggy. They also had the usual cereal, pastries, bagels, toast, and yogurt. We only ate there the first day & after that ate out for breakfast instead. Some freeway traffic noise. We had a nice stay here. We would stay again. The Hotel was clean and staff very professional. Hotel was close to restaurants and shopping. Gas station was close by. We were in California for our sons wedding. The wedding was in Fallbrook, Ca. We were only 20 minutes from Fallbrook. I've stayed at Best Western hotels often in the past year across the United States. I find them all to be comfortable, clean and the staff very attentive to my needs. They are also conveniently located near many main cities. I will continue to use them in the future. "Good value, easy freeway access"
We found ourselves too tired to keep driving and in need of a place to stay. 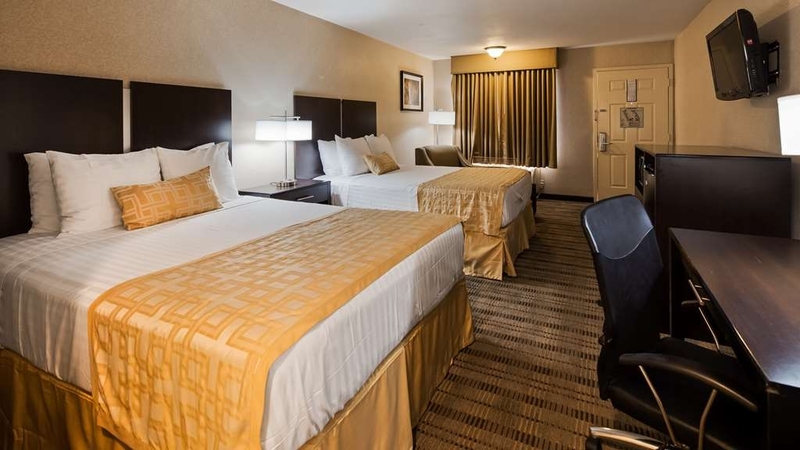 Temecula can be very pricey and all we wanted was a comfortable bed, a clean room and a decent price. This BW fit the bill--nothing fancy but easy freeway access and a typical hot breakfast in the morning before hitting the road again. My only complaint was for the other guests--pet peeve time--why do adults think it's cool to come to breakfast in their pajamas?! Come on--it just doesn't take that long to throw on a pair of jeans! I was only staying overnight. Everything was great except that the coffee maker didn't work and it was too late at night to complain. Generally this is a nice hotel with good service. I have stayed there before and will stay there again. This location was little more than a hotel 6 at 4 times the cost. Very disappointed with the accommodations. I choose Best Western as they have always been a great hotel...not this time. There seemed to be a bit of attitude because this is the "wine country" There are a lot of choice...choose wisely. See comments earlier. Poor communication, excessive noise, bathtub malfunction, had to change rooms 3 times. No recognition for Diamond status with BW. No apology for inconvenience when asked to change rooms due to painting. "Best place to stay in Temecula"
This Best Western is very clean, staff is great and their complimentary breakfast is so good. Bacon, scrambled eggs, hash browns, fruit, toast, danish, yogurt, juices and coffee -- what more could you ask for? It is close to shopping, restaurants, and wineries and the casino. Great place to visit. Rooms were standard, little outdated & needed some cleaning. What made it great was the excellent service. Hotel staff was wonderful!!! They also provided a nice hot breakfast which was a plus.it was cold we asked for extra blanlets, they said no problem. Will come back. Due to unexpected events we found ourselves spending the night in Temecula at a time when nearly every hotel room in Southern California was occupied. I felt fortunate to snag a room at the Country Inn via Trip Advisor and while it's not a place we might ordinarily have chosen we found it perfectly adequate. The desk clerk was friendly, and while our room looked a bit dated it was clean and neat; the bathroom had recently been refurbished. There was a small refrigerator and microwave, and the beds were quite comfortable. Overall, not a bad place. No complaints here! Everyone was nice and helpful. Had an issue w/ my tv late at night and the front desk guy came and fixed it right away. Continental breakfast was great! Was dbl charged on my credit card, and had to call in a cpl times, but the issue is being resolved. No problems. Would consider staying here again, if there's nothing cheaper. great location. currently upgrading facility. comfortable and not overly busy. great value in the Temecula area. friendly staff and not to talky which is a positive. not quite enough room for breakfast yet. Jose and Taylor were friendly at check in. Breakfast was great. It was not loud and no road noise. Loved the hot pool and jacuzzi. So many ameneties. Breakfast was great with bacon, eggs, sausage, and your lighter cereals! A++ for your dollar. I loved my stay!!!!! This Best Western was in a great location to the event I was participating in. 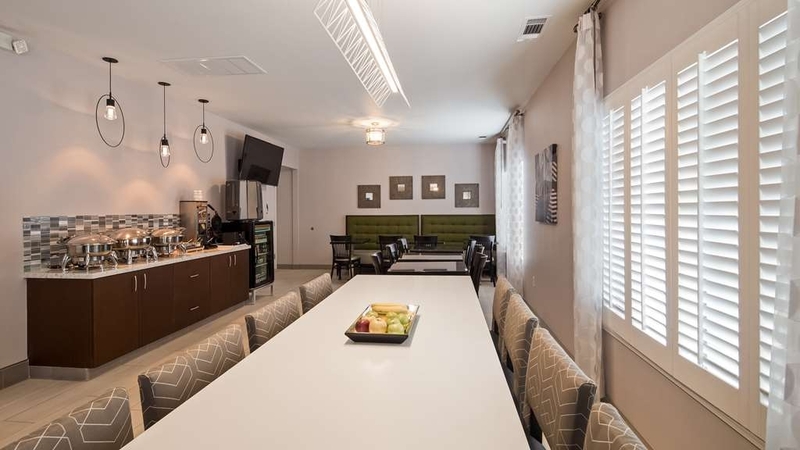 The rooms were clean, the lobby was clean and inviting, the staff was friendly and helpful. The complimentary breakfast was very good and presented very nicely. There was plenty of seating. I would recommend this to someone in the area and I will stay here again. "Best deal in to wn!" This motel is a great deal for the area. The room was clean and comfortable. Staff was very nice. This trip was part of a business/leisure vacation. We enjoy visiting the wineries and it was a nice break from the Minnesota cold. All of the staff at Best Western made my stay very comfortable and a pleasure. I appreciate the professionalism and courtesy shown to me and my family during my stay. I will definitely stay at the Best Western during my next visit to Temecula. Nothing to complain about. Very friendly staff and loved it! Diana and Taylor were very helpful. Breakfast was great. Bacon, eggs, hasbrowns, waffles! It was a wonderful experience. I would recommend this hotel to anyone! "Good Breakfast and great heated pool..."
I will start off with the positive...their breakfast was very good. Bagels, yogurt, toast, cereal, hard boiled and scrambled eggs and real bacon. It also goes from 6-10 am, which was nice. Now, the not so good. This is not an INN, it is a Motel. The rooms were fine...had a refrigerator that worked very well and a microwave. The bed was ok..not hard or soft. The pullout couch was paper thin and not very comfortable (per my son). There were also no linens in the room and i had to go down at 8pm to get them. They gave me 2 blankets and 2 fitted sheets. With the exception of the gentleman who was working when we checked in, I found the other 4 staff members i interacted with lacking in customer service skills. They didn't seem to care for their jobs much and had no personality, in my opinion. The pool and jacuzzi were very nice...pool was very warm and the jacuzzi was just right. The kids were able to play in the pool at 10 am on a cold January morning. Overall the room was clean and attractive, but attention to small details was lacking, ie: missing light bulb, toilet tank did not fill/flush consistently, paint around bottom and side of door badly chipped, and LOTS of baseball size circumference lumps under carpet. (Not as raised as, baseball, but as big around). Also, they did not give us the type of room we booked, but since it was only one night, we didn't ask to be moved.Breakfast food was lukewarm and bacon was soggy. We have eaten at many Best Western breakfasts, and this was one of the worst. We also had an unsatisfactory rate discussion at checkout. As a rewards member, I don't feel they responded well to us. Convenient location, close to restaurants, old town where a treasure trove of antique shops and specialty small stores await you, and the mall. Edwards Cinemas close by. Room heater was a bit noisy and was a nuisance during the night. Easy access to the wine country. 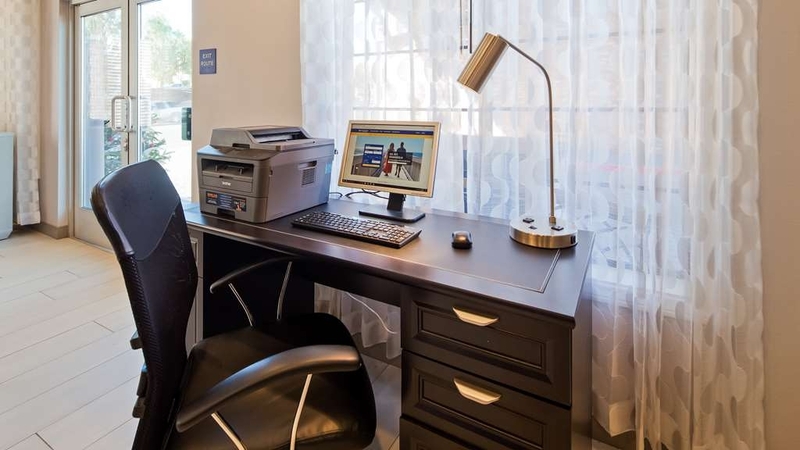 "Convenient, Friendly, and Great Staff"
We needed to stay in (or around) Temecula for a short business trip (3 days) and enjoyed finding a reasonably priced accommodation with great staff, solid breakfast and good location for our needs. If there was a drawback (we didn't consider it to be one) - was that we walked up a flight of stairs (good for at least a little exercise) .... overall we would come back and stay here again. Our desire was for a relaxing weekend away, and that is exactly what we had. Clean room, privacy, comfortable, and leisurely. 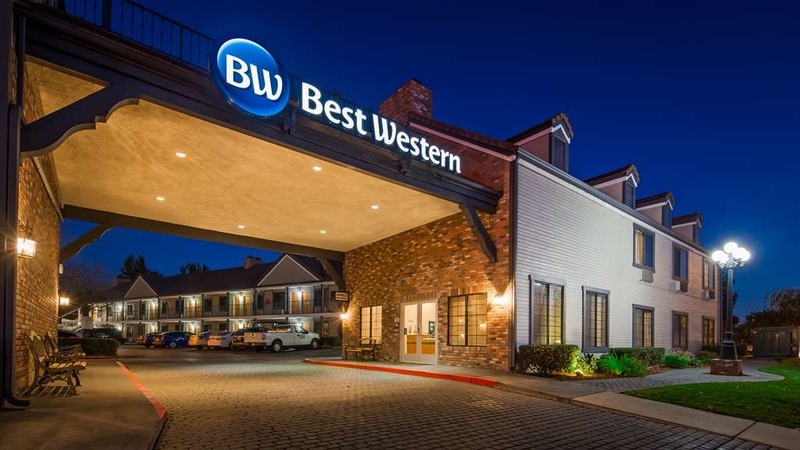 I would certainly recommend this Best Western to friends and family who are heading to Temecula, CA. It was a great location for everything we wanted to do while we were here. Stayed here last night for an overnight stay. I was pretty pleased. I have never stayed at a Best Western and was pleasantly surprised. This is an older hotel with sort of a motel feel but it was fine for an overnight stay. The room was immaculately clean and neat. Also Diana in reception was awesome. So nice and gave us a free upgrade. I wouldn't vacation here, but would definitely stay again for an overnight stay. "I wouldn't recommend this hote.."
Our arrival was about 7:00 pm, the check in was impersonal and hurried. I was given our room keys and told breakfast was through that door. Breakfast was 6:00 a.m. toe 9:00 am. and that our room was across the parking lot. The room had a musty smell and had very few florescent lights (very cold in color). The single sink didn't drain well. The TV remote wouldn't turn the TV on or off nor would it control the sound. The bed was OK is guess. I would say the room is about a Motel 6 ½. Friendly service, breakfast was nice, but a few details need some fixing. Door jambs and floors where they meet walls need deep cleaning. Lack of parking during some construction left us without a space. An office attendant kindly helped us find an odd place to park, but a little scary since we were in a rent-a-car and didn't want damages of someone backing into our vehicle. The tv had no directions for use and since it was direct tv, needed office help who said the tvs weren't consistent from room to room, therefore no printed directions. Reception was fine once we figured out how to sequence the tv with the direct tv service. Guadalajara Restaurant, a block down the street, excellent. My Wife and I were Greeted with a Very Friendly Staff. 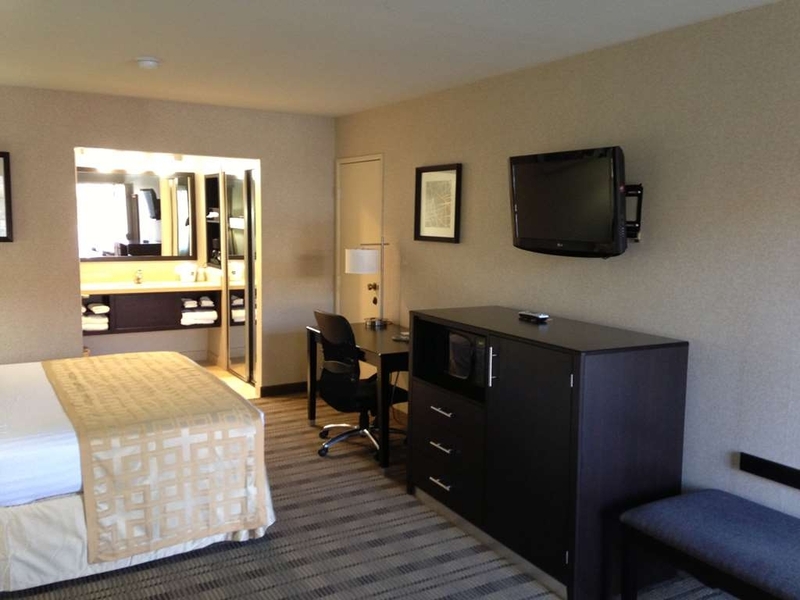 Room was recently remodeled and in Excellent Shape. Very Clean which is a must for my Wife. Overall Experience was Awesome. I would Definitely recommend the Country Inn to anyone especially the people that are coming to town for the Wine Tasting and cruising through the Wine Country. I give it a 10! The price was right. Typical hotel breakfast. Very nice pool with hot tub and both had lift chairs to help someone who needs that service. Bed was good and a good location, we would stay again if in the area. If you are looking for a place to stay at an affordable price this is the right choice. Hotel is quiet. But some noise from the freeway. Bad carpets and spots on furniture. But bed and bath are clean. Ample hot breakfast. Good size rooms with refrigerator and microwave. I am a former Military, (usmc) Sgt, landed on Camp Pendleton in 2000, this was the first and last time I ever stay at this hotel. Not only was the front desk staff very unfriendly, but the bedding was dirty and had hair in between the sheets, the bed also sank 2-3 inchs. The hotel is surrounded by better hotels that are definately worth checking out first i promise. Great hotel!Nice location.The only thing that I can recommend is the rooms look like they need a make over!The staff could be a little more friendly.However for a convenient hotel this one fits the bill. Absolutely satisfied and shall return. Reasonable price with quality included. Convenient location is nearby Old Town, Temecula and HWY 79S which leads Wine Country (Temecula Wineries). I prefer their kindness and consideration. My husband and I were in town for a wedding and needed a room to stay in for one night. I am glad that I found this place. Check in was less than 5 minutes and our room looked just like the one in the picture posted. It was decent, roomy and clean. The wifi was quick and free. Although we were in room 203 and back near the busy highway once in the room we didn't hear much at all. I booked the room on Priceline and it was worth what I paid. Also, we didn't get up in time for the warm breakfast but there is a place called Mo's Egg House down the street that had great food. I will def. be staying here again. "Will never stay at this hotel again"
Took my mom on Mothers Day with my sister wine tasting. When we got back to the hotel I wanted a friend to use the guest bathroom, but since she wasn't a guest they refused her to use the bathroom, REALLY. Rooms were dated, rooms could be cleaned better and it is by a busy freeway. "Nice stay at the Best Western Temecula"
Had to be in Temecula for 2 weeks and spent most of the time at the Best Western other than the nights they were already sold out. Pleasant stay. Had everything we needed and it was comfortable. Wifi worked well. Room service was good. Overall the Hotel was fine, a few little things, but nothing major. The staff were helpful and friendly. the breakfast was very good, fruit was fresh and there were many items to choose from. The Hotel needed some updates and few flaws here and there. It was quiet and we did sleep well, the bed was comfortable. 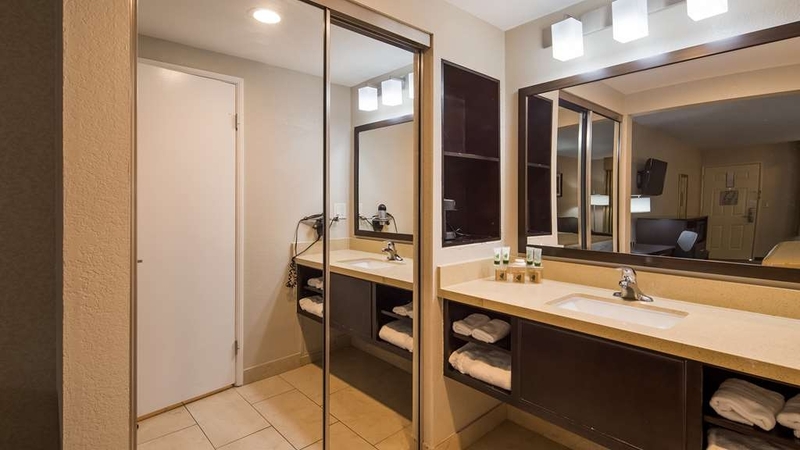 My husband and I wanted to visit the Wine Country in Temecula, but didn't want to have drive home afterwards so we decided to get a cheap, but clean room to stay for the night. I'm the picky one, so I looked and looked and found this gem!!! Very inexpensive, but very nice and clean! I would definitely stay here again. The complimentary continental breakfast was also good. It consisted of the usual cereal and danishes but they also had eggs, bacon and waffles too. The room was large with a king sized, comfortable bed and it was very quiet for a Friday night. This hotel is also extremely close to all of the wineries so cabbing it or Uber-ring it back to the hotel is pretty cheap too! If your looking to spend your money in Wine country and not on your room, this is your Inn!! "Stay went well, bed was hard"
The staff was nice and the amenities were actually nicer than more expensive hotels (i.e. bigger and newer fridge, new microwave) Its nice to know they have individually wrapped plastic cups instead of glass for sanitation reasons. The only real problem was the bed. It was older and very hard. Price was the most reasonable.